There are many interesting places to visit in Jefferson City, MO, but perhaps one of the most fascinating is the Missouri State Penitentiary (MSP), where you can not only learn about history, architecture and famous prisoners, but sit in an actual gas chamber—which, yes, is as creepy as it sounds. The oldest continually operating prison west of the Mississippi, MSP was opened in 1836 and at one time housed 4,900 inmates. Dubbed the “bloodiest 47 acres in America,” the penitentiary closed in 2004 and began offering tours in 2009—and they always sell out. Visitors can choose from a two-hour history tour for $15, a more in-depth three-hour tour for $26, or a nighttime two- or three-hour ghost tour, which ranges from $26 to $36. While I didn’t go on the ghost tour, I’m honestly not sure how much scarier the tour needs to be—just looking into the small cells stacked up to the roof of the building connected by rickety catwalks in A Hall is terrifying enough; heading down into the dungeon cells is practically paralyzing. For the seriously strong of heart, there is an overnight paranormal tour that explores the Death Row cells—something I don’t think I’ll ever need to do in this lifetime. The history tour is fascinating and after hearing both frightening and funny tales of those who stayed there—my favorite was of the contraband carrying cat—you get time to actually wander the cramped cells. Up to eight men lived in each cell in the 1800s—conditions improved slightly over the years, with later inmates in the Honor Dome allowed to paint their cells any color that they wanted. Visitors to the penitentiary can still see some of those paint jobs today. It’s hard to take in how inhumane conditions were back in the early days of the prison; from 1836-1938, there was no running water, so water was brought in and put into horse tanks, which the prisoners had to drink no matter how rank it got. Women were kept in the same place as the men up until 1904 when they were given separate quarters; they moved out entirely in 1926. The most haunting part of the tour was a visit to the gas chamber, where 40 executions took place over 168 years. You can actually go into the chamber and sit down, and while I’m not normally disturbed by things like this, I have to say the experience left me a little shaken imagining someone’s last moments in this setting. 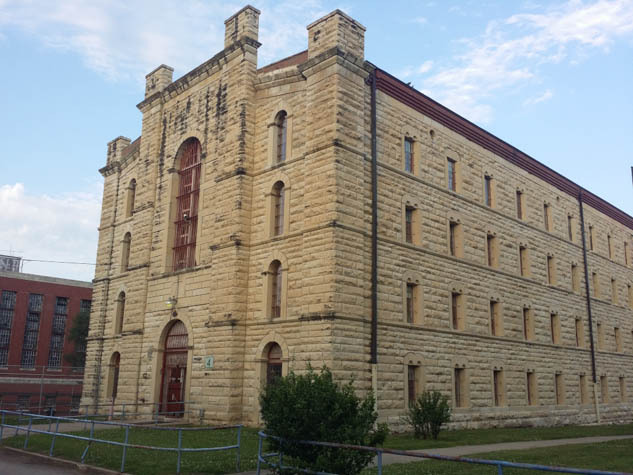 You can learn all about the infamous inmates who stayed at the penitentiary when you visit the attached Missouri State Penitentiary Museum, located in the Col. Darwin W. Marmaduke House. Marmaduke was a former warden at the prison. Displays feature detailed stories of past residents including Pretty Boy Floyd, five-time world boxing champion Sonny Liston, and James Earl Ray, who spent six months in the prison before escaping in a bread truck and killing Martin Luther King a year later. What really struck me is that the men, including the Keno Brothers who were bank robbers even before Jesse James, actually committed real crimes; the women were usually put inside for “solicitous acts against the government,” such as encouraging people not to sign up for the draft, and promoting women’s suffrage and birth control. I was also really intrigued by an exhibit showcasing the artwork that prisoners had made, some of which could easily sell for five figures in a high-end gallery. There were also displays focusing on prison guards, instruments of “control,” and prison industries, which included at one time the largest saddlery in the world. While you do have a lot of options about the type of tour you want to take, visitors are limited by the fact that the penitentiary is only open from March until November. Unlike the prisoners who had to suffer year-round in this unheated facility, those who visit do not have to freeze during the winter. Note, however that you should definitely take the fans offered—in the summer months, the lack of air-conditioning (and the overwhelming desire to taste freedom again) can really take a toll as you near the end of the tour.